Get an alive character into the Hotel penthouse. Stay for all the credits. Push the circus mime over. Collect 25 specks of dust. Read 100 books in the library. 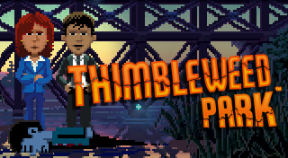 Read all the Thimbleweed Nickel newspapers. Visit every floor in the hotel. Collect 50 specks of dust. Listen to 100 Voicemail messages. Make everyone cry about their life. Navigate to the buried treasure. Grow Leonard's plant to superhuman size. Collect 75 specks of dust. Don't pick up any specks of dust.